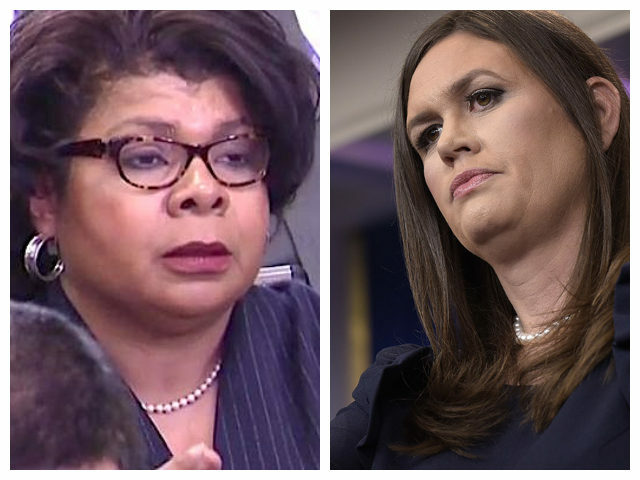 White House Press Secretary Sarah Huckabee Sanders drilled into correspondent April Ryan on Tuesday, for her constant interruptions during a discussion of President Trump’s reaction to the NFL national anthem protests. Sanders called on another journalist, but the Urban Radio Networks correspondent interjected saying, “Is the president aware that …” and continued her question despite not being called upon. Sanders tried to ignore the interruption and said, “Sorry, Stephen, go ahead,” but Ryan persisted in taking her colleague’s time away and pushing her own question anyway. Sanders then let Ryan ramble on and finish making her point — it wasn’t really a question, but a statement. “The underlying issue that keeps going about disrespect of the flag and soldiers. Is the president aware that taking the knee is about police-involved shootings?” Ryan said. The president has made his position crystal clear on this topic. He feels strongly that standing for our National Anthem is something that we should do, something that matters to what makes our country special and unique and what sets us apart. He’s not going to waver on that. He’s not going to apologize for it.” Sanders continued, “Frankly, more than 70% of Americans agree with him on that matter. This has been made a political argument of which the president is not going to back down from, and he’s been clear on it. Ryan was still unsatisfied and continued to yell at Sanders, but the president’s spokesperson wasn’t having it. “April, I’ve addressed your question, and I’m not going to continue to engage with you,” she said. Sanders went to another correspondent even as Ryan continued to yammer. “I’m going to deal with the issue of addressing your colleague’s question,” Sanders finally said cutting Ryan off.